The best questions to ask in a job interview are those that show your understanding of the company and your ability to successfully perform the tasks of the job. This is your chance to send a positive message to a potential new employer. You should come into the interview with a list of four to five potential questions. The actual questions you ask will be based on the conversations during the interview. Be sure to pay attention to information received from the interviewer since it could be used as the basis to either ask a question or to decide how much time you will have to ask questions. Be prepared to ask a few questions specific to the job. Is this a new position or one that is being filled to replace someone who has been promoted or is leaving? What are the primary responsibilities of the job? What improvements would you like to see in the way the job is performed in the future? What are the key challenges in this position? What percentage of the work is routine and what percentage changes day-to-day or week-to-week? What qualities will it take to perform this job well? What are the top three priorities that you would like to see accomplished in this position in the first 90 days? Demonstrate your interest in becoming part of the company's team by asking a question or two specific to the organization. Will you explain the organizational structure? What kind of performance appraisal system does your company use? Does the company provide ongoing training opportunities for employees? How would you describe the environment or culture in the company? Do top performers ever leave the company? If so, why do they leave and where do they go? What are the company's strengths compared to its competition? Are current employees considered for promotional opportunities? Ask questions that can help you gain insight into what to expect next. Now that we've talked about my qualifications, do you have any concerns about me being able to do a good job in this position? You mentioned that this job require strong computer skills. What particular programs are used most frequently? I'm very interested in this job. What is the next step in the hiring process? When do you plan to make a decision about filling this position? There may, of course, be things you'd like to find out that are not included on this list. Feel free to create your own questions, keeping the following tips in mind. Ask clear, simple questions. This will help demonstrate your ability to focus. Don't ask too many questions. Watch the body language, facial expressions and comments of the interviewer to determine how many more questions the interviewer will feel comfortable answering. Only ask questions for which you are interested in knowing the answer. It will be obvious if you are not interested in the answer. Use questions to demonstrate your knowledge. Listen to the information provided and ask more detailed questions which are based on the information provided. Don't ask questions about salary and benefits. Let the interviewer start the conversations about money. Don't ask questions that are answered on the company's website or brochures. This would only send a message to the interviewer that you did not do your homework on the company before the interview. Knowing what not to ask is as important as knowing what questions to ask. Don't ask the name of the person who will be supervising you. You don't need the name of the supervisor at this point. If you're coming back for a second interview, the recruiter may or may not give you the name of the person with whom you'll be interviewing. It might not be the supervisor. Many times, the recruiter will simply state you should ask for her. This is because schedules must be coordinated and sometimes more than one person will talk with you. Don't ask about salary at this point. Asking about salary during the first interview is considered unprofessional and may cost you the job. Don't place the recruiter in an awkward position by asking inappropriate personal questions. Don't ask for details about benefits at this stage of the process, unless a benefits packet was given to you prior to the interview. Most recruiters will mention the benefits package in brief generalities during your interview, such as if there's a 401(k), 10 paid holidays, two weeks of vacation after six months, excellent health and other insurances. If you aren't invited back for a second interview, it won't matter. If you do come back, more information and details will be shared with you. Don't ask about your possibility for promotion. Career paths are discussed much later in the interview process. You don't want the recruiter to feel you're more interested in the next job level than the current open position. Don't ask how many people are interviewing for the position. You should be more concerned about whether or not you're going to the next step. You should come into the interview with a list of four to five potential appropriate questions. The actual questions you ask will be based on the conversations during the interview. Be sure to pay attention to information received from the interviewer since it could be used as the basis to either ask a question or to decide how much time you will have to ask questions. 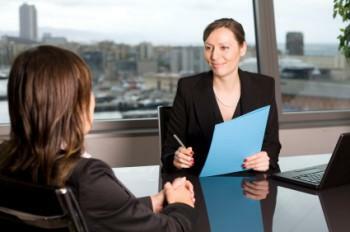 At the end of the interview, the recruiter is likely to ask if you have any questions for her. Choose two or three of your prepared questions, selecting items that are appropriate within the context of the interview. Avoid giving the impression that you have poor listening skills by making certain not to ask for information that was provided during the interview. Refrain from drilling the recruiter. Don't place him or her on the defensive. When you receive a response, you can certainly follow-up with another question to gain clarification.